The Students produced a rampant second-half display as a hat-trick from Greg Swann and further goals from Aidan Kemp, Max Condie and Santeri Kulvalainen blew the Innerleithen men away. That lifted Dorian Ogunro’s side up two places into tenth position in the table and midfielder Daniels-Yeoman reckons the emphatic result had been in the pipeline for a while. “We’ve been threatening a result like this for a little while,” admitted the 29-year-old. “We always say that we’re going to blow a team away at some point and it always seems to happen at this stage of the season. “It was a very good performance and more importantly we managed to back up our win over Gretna last week, which we haven’t done often enough. “We’ve had an inconsistent run of results, but this league can be ridiculous at times because if you win a couple of games then you can move from down towards the bottom up towards mid-table. “It’s pleasing to be in a position that we feel reflects how we’ve been playing recently. The two main problems that have held us back are that we’ve conceded too many cheap goals and failed to take enough of our chances. Meanwhile, Civil Service Strollers ended their league campaign on a disappointing note as they crashed to a resounding 3-0 defeat against Cumbernauld Colts. Gary Jardine’s side failed to fire at Broadwood Stadium after two penalties from winger Craig Holmes and a goal on his return from injury for Sean Brown handed Colts maximum points. Civil’s hopes of securing a top-four finish are now out-with their own hands after closest pursuers Spartans drew 1-1 with East Stirlingshire to move within a point of their Capital rivals. Andy Rodgers had given the Falkirk men a 72nd minute lead from the penalty after defender Adam Corbett was penalised for a handball in the box. Youngster Blair Atkinson salvaged a share of the spoils after he controlled Alan Brown’s cross before side-footing low past keeper Jamie Barclay with 11 minutes remaining. A point at home to Cumbernauld next Saturday is required for Dougie Samuel’s men to leapfrog Strollers in the table. 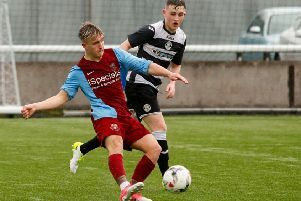 Relegated Whitehill Welfare suffered their tenth home defeat of the season as Matthew Flynn’s second-half strike handed Edusport Academy a slender victory at Ferguson Park. Ian Little’s side, who will play in the East of Scotland League next term, face Edinburgh University on the final day next weekend before turning their attentions to the end-of-season League Cup. Elsewhere, East Kilbride suffered a first defeat at their K-Park home this season against BSC Glasgow, who secured second place, but the champions revelled in the post-match trophy celebrations.